… Will there be a hue and cry over demolition of a structure built by an invader over an existing place of worship. I am talking of Ram Janma Bhoomi and the Babri Masjid. Today the senior BJP leaders are in Varanasi to present themselves in the court for the alleged conspiracy case and thats what triggered this post. I am a history buff and an agnostic when it comes to religion. I believe that all religions are dead and each of us has to find our own religion. I also don’t believe in having temples and places of worship for a God (if you are a believer), who is omnipresent. Either God is omnipresent or he/she isn’t … if he/she lives only in the place of worship, something ain’t right. I agree that when a large number of people congregate and pray or meditate, there is a different energy to that place and thats how the temples and places of worship were built. The oldest temples in India, besides being architectural marvels were also located in such a way that they could take the lightning strikes and keep the surrounding town/village safe. Babur is a conqueror who came from Persia … he fought wars and won and so laid the foundation for the Mughal empire. Babur’s ancestry from his father’s side goes to Timurlane and from his mother’s side goes to Genghis Khan. While Timurlane was Muslim, Genghis Khan was a Shaman, so Babur is actually of mixed lineage. He wrote copious notes and the compilation is called “Baburnama”. 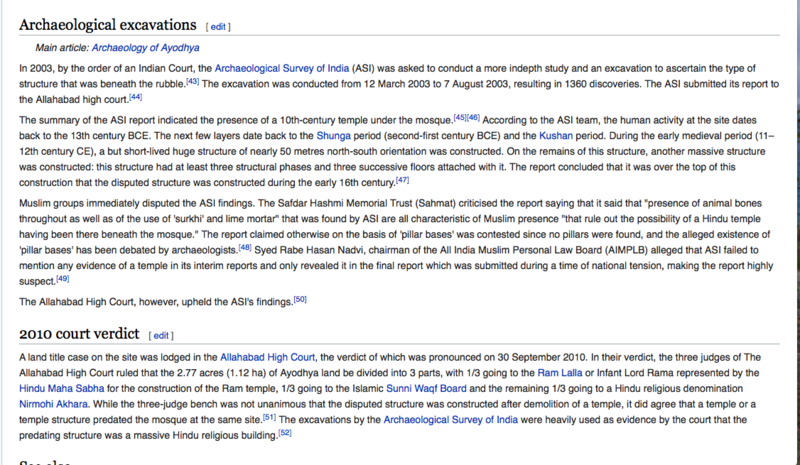 Interestingly the Baburnama doesn’t mention the Babri Masjid (Mosque) allegedly commissioned by Babur. Historically speaking, Hinduism has been around far longer than any other religion in the world. Christianity is 2000 years old, Buddhism is 2500 years old, and Prophet Mohammed was born in 570AD so Islam couldn’t have been around before that. Even if we were to assume that RigVedas signal the birth of Hinduism just for us to form a timeline, then Hinduism dates back to 1500 BCE. Now go chew on this awhile. The Ram Janma Bhoomi – Babri Masjid site has been a disputed one for ages, even before the British colonised India. Historically again, Babur was an invader, he was not born in the Indian subcontinent. So while we can be civilised about the structures he built, and Uzbekistan can celebrate him as a great man, it doesn’t mean that we should not allow the Hindu majority in the country to pray at the place they believe Lord Rama was born!! Imagine if the Indian emperor Ashoka had conquered Rome and built a Buddhist temple on top of the Vatican or Chattrapati Shivaji Maharaj had conquered Saudi Arabia and built a Bhavani Devi temple at the Kaaba, would they have remained there in today’s day and age?? Am sure many Christians and Muslims reading this blog are feeling offended at the mere mention of such an eventuality, but thats precisely what happened at Faizabad, U.P. There was an ancient temple there and Babri Masjid was built on top of it. And in the name of secularism and vote bank politics even mentioning that there was temple has become unacceptable. If India was truly secular then the citizens of India who follow Islam would have helped in razing that structure down and helped their fellow citizens who follow Hinduism to build a temple in its place. The mosque is a place to congregate for prayers and there is no idol worship in Islam. So a mosque can be anywhere. This particular site is deeply personal and much revered for the Hindus – why not just give it up? I am not speaking with religious fervour, I honestly don’t care whether there was a temple underneath the Mosque – I am only speaking with logic. If Allah is omnipresent, then the mosque can be anywhere. While Lord Rama, whether he is Vishnu’s incarnation or he is a myth or he is a historical super hero – is born (or created) on the Indian subcontinent. Why have a dispute over someone who is revered by millions and whose alleged birthplace predates an invader’s structure ? It just defies logic. Here’s an excerpt from Wikipedia about the Archaeological findings at the disputed site, which has further led to disputes! In this same Wikipedia listing about the controversy, there is a statement that says, the demolition of the Babri Masjid structure in 1989, infuriated gangster Dawood Ibrahim …. I didn’t know whether to laugh or cry. Whether that most wanted criminal is happy or upset – how do I care? Anyone who kills innocent civilians for any reason except in defence, is a criminal and needs to be behind bars. The very fact that Wikipedia thinks its important to mention how Dawood Ibrahim feels about a certain thing shows how far the appeasement policy has gone! Now, as a Hindu, I am deeply pained by the fact that even after becoming a democracy, I dont have the right to pray at Ram Janma Bhoomi – can any secular $&*?? @ fix my feeling? Interesting blog, but I found it a little confusing. Is this fundamentally a Hindu/Muslim issue? Desecration of ancient sacred sites seems to happen all over the world, such as what the Europeans did in the Americas. Who knows how old some of those civilizations were, but they were no match for the gold seekers, colonizers, and pipeline builders. Katharine, its not just a Hindu/Muslim issue… the problem in India is, we seem to celebrate an invader (Babur, the first Moghul emperor) because the political class wants to appease the Muslims for votes. Invaders have desecrated Hindu temples and Independent India’s politicians seem to continue down the same vein. The British used the “divide and rule” policy and incited the Hindu/Muslim divide… unfortunately Independent India has furthered that policy. For the Hindus, the temple that lies beneath the Babri Masjid is the place where Lord Rama, one of the most important incarnations of Vishnu was born – it cant get more sacred than that. Even after gaining independence from the British, our government seems to allow a dispute over this temple. The Muslim leaders are using it as a political point not thinking about the fact that it hurts the sentiments of their Hindu brothers and sisters. I still feel the common man who is a Muslim will not have any objections to let the Hindu common man build a temple there and pray. That’s what I don’t like – how dirty politics is dividing communities. Bindu, Thanks for the explanation. It is sad, isn’t it, to see such disrespect for ancient traditions. I’m no fan of the Brits, for reasons like this. Unfortunately, the US was created in the British image, and too many other political leaders are following their examples.